M69 pickup rings come in a few sizes. 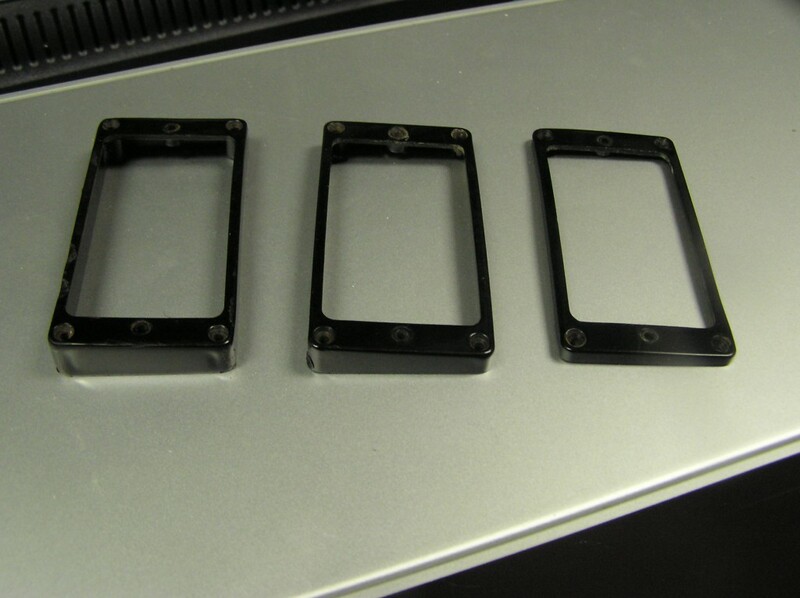 The middle one and the one on the right are the typical ES-335 sizes. The bigger one sometimes shows up as a bridge ring but is more typically found on Les Pauls or ES-175s. Want to get a Les Paul guy all excited? In the immortal words of Mr. McGuire in “The Graduate” …”Plastics”. It must be something about white plastic that gets them going (and big prices) because most of us ES-335 types don’t really get that worked up. The little bitty piece of plastic they get all hyperventilated about? Pickup rings. You think it’s crazy that a little decal on a pickup can make a $1000 or more difference, you ain’t heard nothin’ yet. A pair of black pickup rings will cost you a pretty ridiculous $275. A pair of (authentic) white ones? $10,000 or more. I get a surprising number of emails asking about these things. Questions about the height of the bridge pickup ring is a big one. Because the rings were made in a number of different heights, it’s no wonder there is some inconsistency in them . To be certain that your ES has the correct rings, look at the underside. If your ES is from the 60’s or earlier, then both rings will have the letter M and the number 69 on them. That’s why they call them M69 rings. The left leg of the letter M is always missing or weak. Some fakes don’t get it right but there aren’t a lot of fakes out there in black. There are plenty of repro white ones (which didn’t come on any ES except the ES-295). There are all kinds of “mold marks” and little inconsistencies in the rings which is important in identifying whether they are original or repros. If you want the really fine details, you can find them on Clay H’s excellent vintage guitar site here. I can’t do better than he has done-it is very comprehensive. I will note that all of the little “mold marks” that he catalogs aren’t always there-probably due to wear and inconsistencies in the pouring of the molds. I just pulled a pair off an all original 59 ES-355 and the bridge ring is missing a few on the bottom. I usually make the assumption that if the pickups are original and the plastic shows the M69 and other “readable” markings and the right amount of wear for the guitar they are on, then they are probably original. If a “mold mark” is missing from the bottom, don’t lose any sleep. There is often a lot of wear on them-even the bottom. Also worth noting is that the rings on an ES-335 are not the same height as those on a Les Paul. The neck ring on a 335 is 3/16″ tall on the tall side and 5/32″ on the short side. The bridge ring is taller but not as tall as the one on a Les Paul (or an ES-175). The bridge ring should measure 3/8″ on the taller side and 9/32″ on the short side. 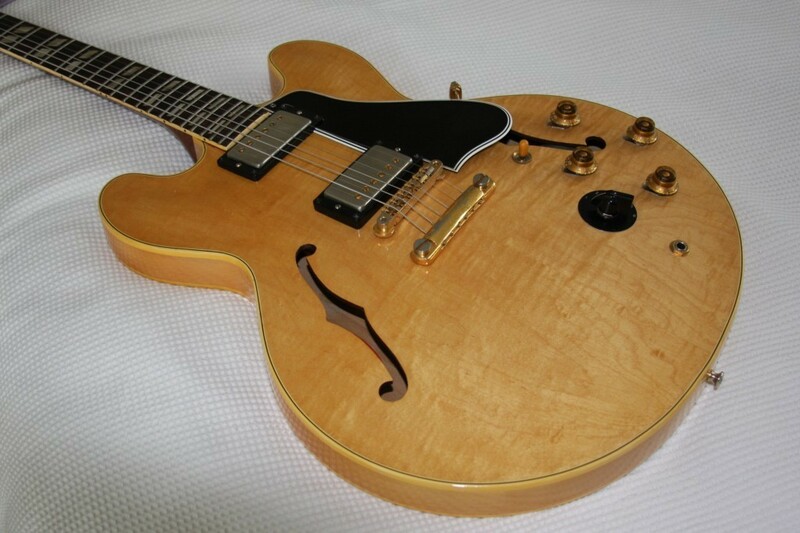 I have occasionally seen a taller version of the bridge pickup ring on some later 60’s ES-335s. While it’s often impossible to tell what’s original and what isn’t 50 years after a guitar was made, I’m guessing that taller rings were sometimes used as the neck angles became steeper . The “tall” rings are more like LP rings and measure 1/2″ at the tall side and 13/32″ on the short. There might be some variation in the heights from wear and from the fact that people sometimes sand them down to make a curve that fits the arch of the guitar. Black M69s have gotten a little pricey lately but they come on so many models that there is no shortage of them. There is another number on the underside of the rings and it will be MR490 on the bridge ring and MR491 on the thinner neck ring. If your ring says M8, it’s from the 70’s or later. I’m not certain exactly what year the change was made-I don’t see a lot of 70’s ES’s. By the early 80’s, they were using M8’s. Feel free to help me out here. One other thing to note is that if you pull the ring on a blonde or sunburst model and you see a thin red line where the edge of the ring sat, it’s normal. The plastic in the rings reacts slightly with the nitrocellulose lacquer and very often leaves a faint red ring. It probably leaves the same ring on the red finished ones as well-you just can’t see it. I’ll take a photo next time I see it. 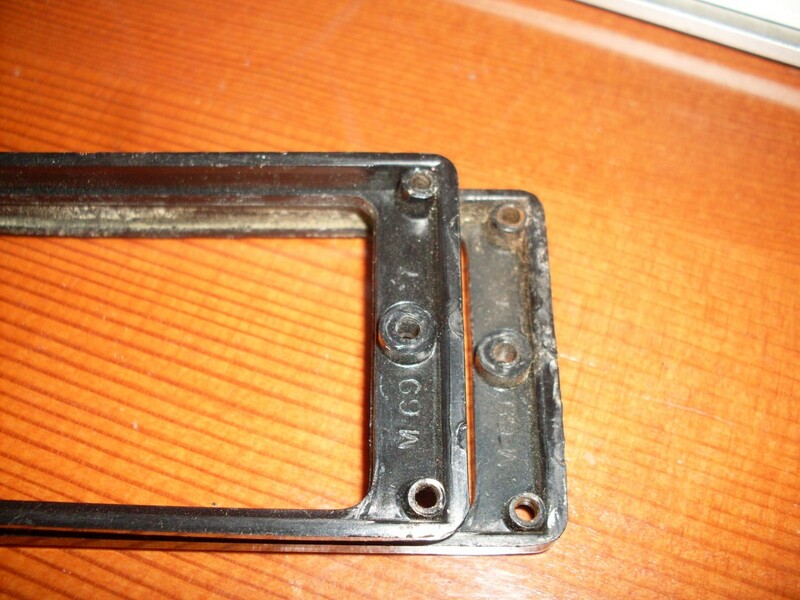 You can see the little halfmoon shaped mold marks on the cleaner of the two M69 neck pickup rings but just because thet are mostly worn off on the other one doesn't make it any less authentic. Wear on these rings is pretty common, so if a mark is missing, don't sweat it. Fallen out of love and it's time to sell? Need the cash? Don't play any more? It happens. Someone even sold me this one. Yes, it happens. 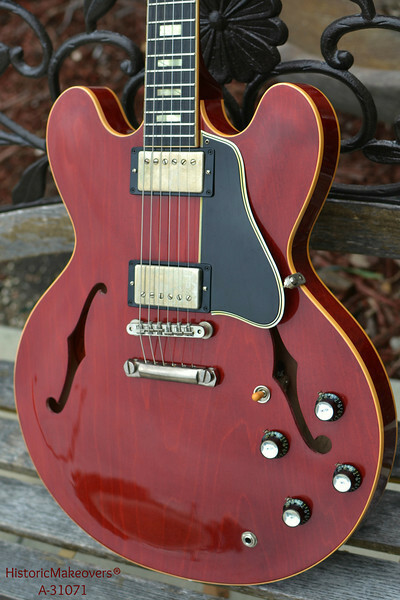 We fall out of love with our once beloved 335 and something else catches our eye. When I became a serious (OK, semi serious) dealer, I had to learn how not to fall in love with every guitar I bought-which is a little tricky since I only buy guitars I fall in love with, it seems. Or maybe you still love the old gal but you just don’t play any more and a pretty $12000 doorstop doesn’t fit your otherwise intelligent lifestyle. Or maybe Grandma just broke her hip and you’ve got some medical bills to pay. Sadly, it happens. As a dealer, if I’m doing it right, half the time I’m buying and half the time I’m selling. And, as a dealer, I can’t buy guitars at retail and sell them at retail. It doesn’t work that way. But you can. I get asked this all the time and it’s not brain surgery. My brother is a brain surgeon and he usually uses the expression “it’s not rocket science.” What does that tell you? Anyhow, here’s a road map for the successful sale of a guitar in this kind of tough post-recession market: Make certain you know what year it is, what model it is and what is or isn’t original. If you aren’t sure, ask someone who knows. Ask me if you want. It’s often impossible to tell which parts are original from even a detailed photo but I can usually tell if they are correct (which to most buyers is fine). Once you know what you have write a very complete description of it and see if you can get a market (retail) price for it. Ebay gets you the biggest audience but there are pitfalls there as well that don’t exist in places like Craigslist (which has its own pitfalls). Scammers abound. What’s the retail price for your guitar? That’s the $64000 question (anybody get this reference any more?). You can go to Gbase but those are dealer prices which tend to be very high (and generally very negotiable). You can look at what others on Ebay are asking but those guitars haven’t sold and may have been listed for years. Really. Years. A good guide is to look up your year and model under “completed listings” in Ebay. If the price is red, it didn’t sell. If it’s green, it did. And don’t just look at the long list, call up the individual listing because the list shows the asking price, not necessarily the selling price in the case of “best offers”. Ebay is a pretty democratic place. Guitars rarely sell for more than they are worth. They do sometimes sell for less and that’s because the listing leaves unanswered questions that scare away potential buyers. And people lie. Another choice is The Gear Page. These tend to be knowledgeable buyers who will very often pay what the guitar is worth if you have what they are looking for. Again, a complete and accurate description is your best asset. Finally, if your efforts to sell at retail fail and they very often will-these guitars don’t sell overnight-then consider offering the guitar to a dealer. And not just one dealer. Shop it around and see what they offer. If a dealer has a willing buyer already on a list for your model and year, he will likely pay a bit more. If your guitar is an easy sell, as certain years are, he may offer a bit more. 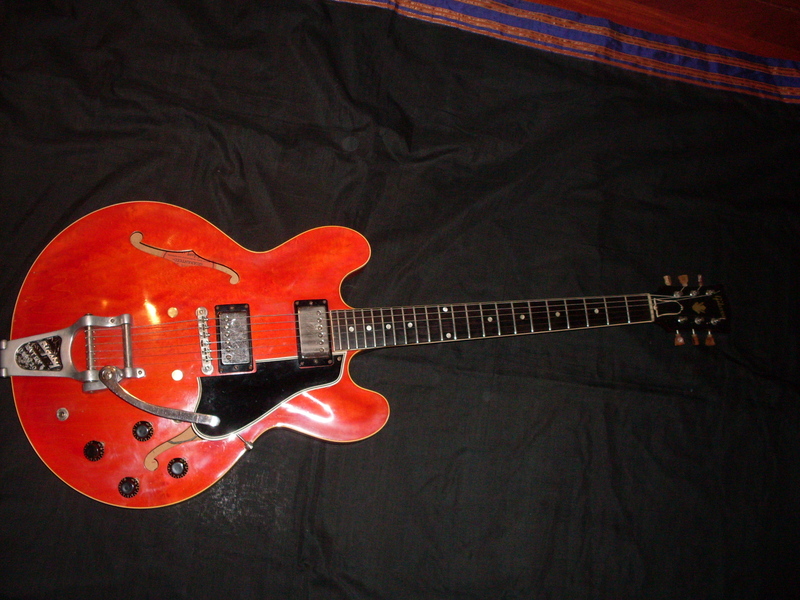 If it’s a stereo ES-355 with a sideways and an added coil tap, you may be disappointed. You may be disappointed anyway because dealers don’t pay nearly as much as consumers but they pay you today. Some guitars take a year to sell. Many take months. If you need to sell today, that’s a consideration (the Grandma hip thing). If you aren’t in a hurry, then take some time and test the market. This could be the prettiest blonde I've ever seen (not counting my wife, of course). And it's a refin. But I want it. For me. One of the great mysteries of vintage collecting is the conventional wisdom that a refinished guitar is worth half the value of one with its original finish-no matter how worn or deteriorated it might be. As a former car guy, I can tell you that a refinished car is worth more than a car with a totally destroyed original finish but perhaps that’s apples and oranges. It seems collectible furniture follows a similar code to that followed by vintage guitar enthusiasts so we’re not the only crazies out there. There has been a small shift in the refin paradigm recently and I think its a good thing. Because the nuttiest of all collectors are Les Paul enthusiasts, it’s interesting that they are the ones leading the charge here. In the past few years, the Les Paul aficionados have taken to getting extremely high end refinishes and other modifications done to their reissue Les Pauls. The leader in this cottage industry is Historic Makeovers. They are very busy guys and they do very, very good work. Now, there are folks selling their refinished LPs, noting which Makeover package was done, and charging a premium. That’s a game change if I’ve ever seen one. It kind of started with aging/relic’ing but it took a while for actual refinishes to command a premium. But now they do. There are a handful of finishers whose work is so respected that to have your guitar refinished by them is no longer an instant 50% drop in the value. I think the biggest difference here is that these elite refinishers are doing a much better (and authentic) job than the folks at Gibson are doing and , frankly, given the cost of these refins, they should be. I can’t tell you how the vintage market will feel about these in 40 years when your R9 really is vintage. There is nothing comparable that occurred during the 50s and 60s unless you count minor custom work done outside the Gibson factory. Things like custom inlays, engraved pickguards and the like are fun and kind of cool (at least I think so) but they don’t command a premium unless the name on the fingerboard is Elvis Somebody. So, when my son is my age and he’s looking for a nice vintage 40 year old Gibson from, say, 1998 will the one with the Historic Makeover command more than the Murphy relic? Or will the factory stock one be the one that appreciates? I don’t have my crystal ball handy. At the moment, this is mostly a Les Paul phenomenon but they have done some work on recent ES models as well. The reason I bring all of this up is because of a refinished 1959 ES-345 that has been offered to me at a price somewhat higher than you would think it was worth using the usual criteria. But then you look at it and you realize that this isn’t just a refin, it’s a restoration at something approaching museum quality. The finish looks stunning, the wood is stunning, the guitar is stunning. I am, in fact, stunned. My good judgment says don’t overpay for this but my usually hard heart (at least when it comes to guitars) says otherwise. Let me remind you, I’m the guy who found two of the rarest ES’s on earth (the very first red 345 and a red 59 335) and sold ’em both without batting an eye. The reason I don’t overpay for guitars is to keep you from having to. But this one is different-it tugs at my heart and says “buy me”. It may have to take up permanent residence here at the OK corral. This looks to be a 63 Historic refinished by HM. Very authentic looking dark red 63-64 cherry. The lacquer they used during this period tends to yellow more than earlier years browning out the red a bit and really making the bindings go yellow. Too bad they can't fix the ears. Nice stuff but $15K???? Maybe if the pickups were whites I'd just say the seller was overreaching. This is maybe $6000 worth of stuff and I'm being really generous only 'cuz I'm a sucker for amber switch tips..
And by we, I include me. Granted, collectors and, to a lesser extent, vintage players are all a little nutty what with getting upset about a changed pickguard screw or the like. There has to be a limit and yet certain sellers will continue to exploit out potential nuttiness. But this Ebay auction is a little insulting. OK, I get original solder, really, I do-it proves a lot on a guitar but this Ebay sale has jumped the shark. The guy wants $15000 for a pair of (black) PAFs that are still soldered to their original harness. I quote: Again, we’ve NEVER seen anything like this, and we (that means you, too!) may never see anything like this again. 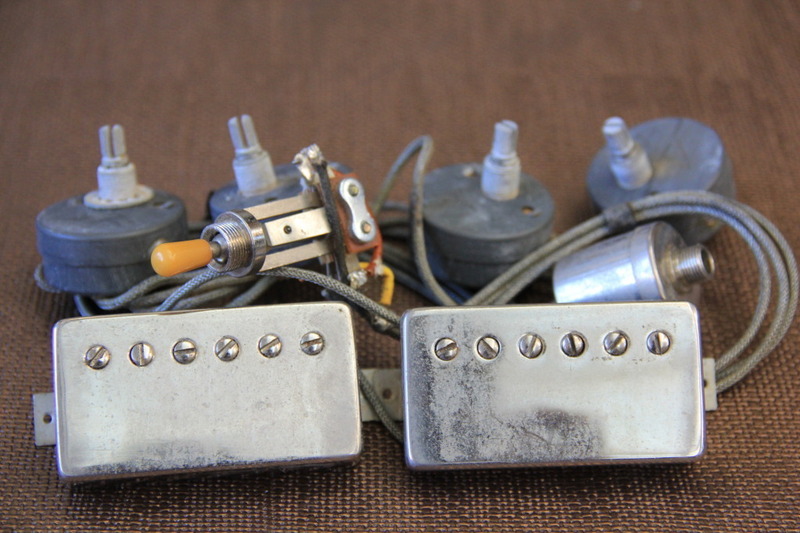 This is a rare chance to own a very, very rare and unique set of authentic 1959 Gibson PAF pickups, pots, input jack and 3-way switch, with original wiring harness and completely unsoldered. Don’t they mean completely soldered? OK, that’s sort of rare because you can only get the harness out of a hollow body without unsoldering at least one pickup. But seriously, so what? They still had to unsolder the ground wire. Where is that? Shouldn’t the ground wire still be attached to the harness?? In any case, the value of this particular setup is only valid for a hollow body because you’d have to unsolder a pickup to install it in anything else. Besides, how many hollow bodies with an intact 2 pickup harness are worth more than $15K? Not many. 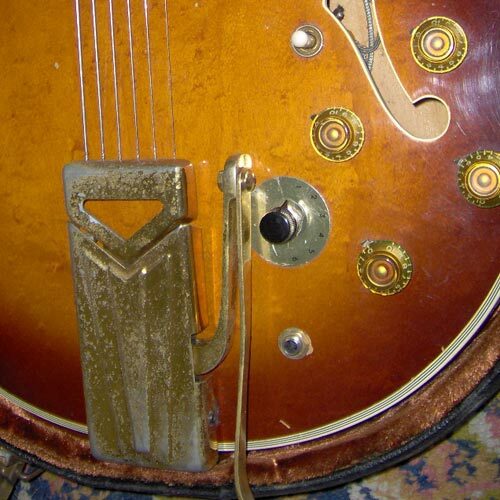 Second, if you bought this harness and installed it in your 59 Super 400 or other hollow body, it wouldn’t be original-it would have the harness from another guitar, so where is the value of originality in a case like this, unless you lie? How would I describe this “restoration” if I were a seller? 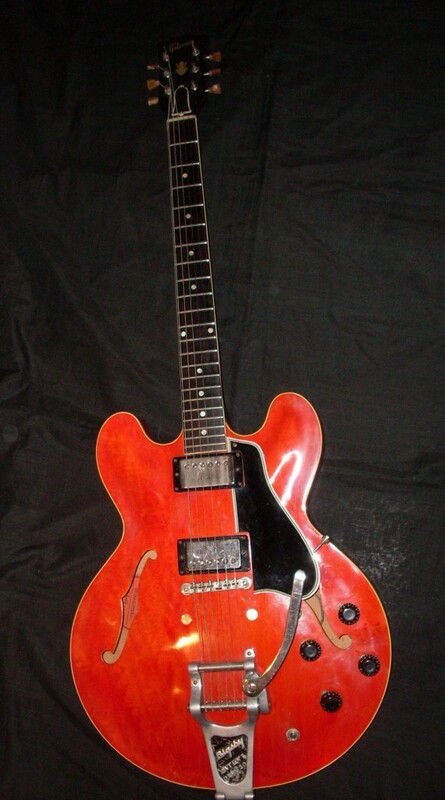 1959 Super 400 with a totally original never unsoldered harness unless you count the ground wire from a different guitar? That’ll bring ’em running. Wait. Let’s look at it another way. A 59 harness on a good day might be worth $800. A pair of black unopened PAFs, again, on a good day might be worth $4000. So the premium, in this instance, for one solder joint (the neck pickup) is about $10,000. We are not that stupid. Not logical enough for you? Here’s another try: I bought an all original 61 dot neck with a repaired headstock last year. It had its original PAFs and the original, intact harness. I think I sold it for $7500 (and not easily). Is this seller telling me I could have routed out the body to allow me to remove the neck pickup and harness without breaking the solder joint and sold the resulting unbroken harness for $15000 (and still had all the goodies left on the guitar)? What a dope I am. I could have made even more since the rout would have been under the guard and the headstock was repaired anyway. The point is that sometimes you just have to let logic rear its head and think about what you are buying (or selling). I understand most of the collector nuttiness-I have to-I’d go out of business if I didn’t. I love the fact that the sticker on a PAF is worth $1000. I love the fact that an unstickered early patent number and an unstickered PAF are exactly the same but command different prices. I love the fact that a white PAF is worth twice what a black PAF is worth. This is what makes these guitars so darn interesting. But, the day a single solder join is worth $10K is the day I hang up my truss rod wrench and say “I’ve had enough.” I’m not saying anything negative about the seller other than he’s being wildly optimistic about the value (and rarity) of his item. He has as much right to ask $15000 for a set of pickups and parts as I have to squawk about it. I’m sure the seller is just throwing it out there hoping to snag a sucker with more bucks than brains but c’mon. I think it’s insulting. Even to us nuts. Well, look here. By cosmic coincidence, I'm parting out a 59 ES-175. So I pulled the harness in one piece just to make a point. NOT rare. Not worth $15K. 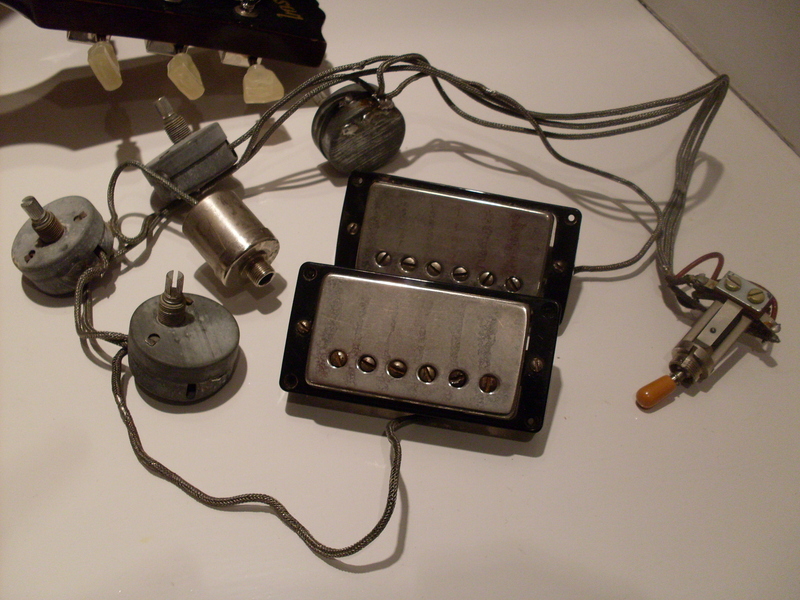 I'm about to unsolder the pickups (sold) and thus lower the value of whats left by, what, $9K or $10K? That's putting your money where your mouth is. Anybody need a 59 harness? only $10,000. I'll throw in the pickup rings (which they didn't include). What the heck, you can have the rest of the 175 as well. Except maybe the switch tip. One of the coolest 355's ever. And one of the rarest. Can you spot anything strange about this guitar? Before the advent of the “Custom Shop”, Gibson was turning out custom instruments for artists, players and just plain folks. While Fender was cranking out its cookie cutter line, Gibson offered one off instruments to just about anyone who wanted one and was willing to pay a premium for it. You could order a 345 with a 355 fingerboard and inlays or a 355 with nickel hardware. If you wanted a stereo ES-335 with a Varitone, they would do that as well. They would also paint your guitar in a color that wasn’t standard, although it had to be a color they offered. With very few exceptions, you won’t find a Gibson painted in a non-Gibson color. 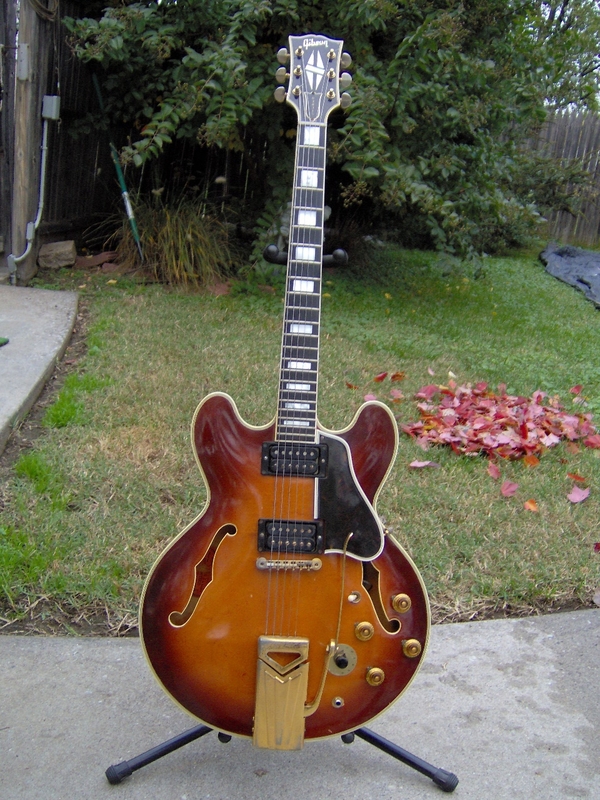 One of the great rarities in the ES line is the sunburst ES-355. The only standard color offered is red. They exist in blonde, black, white and sunburst as well. I think we can safely assume that non red 355’s are all special orders. So, to find a sunburst ES-355 is a needle in a haystack. To find one with bound f-holes is a needle in two haystacks. Gibson didn’t bind f-holes on ES-355’s until the 70’s so to find a 62 with this feature is unusual, to say the least. My first thought was that perhaps they were done after the guitar left the factory but on closer inspection, I believe they were done at Gibson. The way I see it, the f-holes themselves have to be oversized in order to make room for the binding and I just don’t think many luthiers would want to start routing the top out just to get bound f-holes. The likely scenario is that someone called the folks at Gibson (or wrote a letter-remember those?) and asked them to make a sunburst ES-355 with bound f-holes. Note the unusual Varitone knob. Also, the old style bonnet knobs and the bound f-holes. Interestingly, the sunburst is not typical, as you can see from the photos. There is much more red and the darkest tones that are typical of a Gibson sunburst are absent. It is closer to the cherryburst that would appear a few years later. This sunburst a bit more subtle than the later cherryburst with a darker center-more orange than yellow. The guitar also has bonnet type knobs rather than the reflector type that were stock in 1962. You might also notice a few more oddities…the Varitone knob isn’t a chickenhead. This is actually pretty standard on ES-355s with the sideways trem. The reason is simple-the chickenhead knobs bumps into the trem arm making certain positions of the six way switch inaccessible. I had a 345 with a sideways and a chickenhead and you couldn’t get it into position 5 or 6 without moving the trem arm. There is a mystery, however. Why (oh, why) is the truss rod cover upside down? I don’t think that’s a custom option. Thanks to Rob, a regular reader and the owner of this old gal. The guitar was bought new by his father from a local Mom and Pop music store and Rob inherited it when his father passed away. I wish my father had collected guitars. The only thing he seems to have collected was sons (he had 9 of them). This guitar certainly ranks way up there on the cool scale for 355s. I’d put the pickup covers back on if it were mine but that’s just me. If you have a one off or custom Gibson, send me an email with some photos and as much history as you know and I’ll be happy to feature it here. 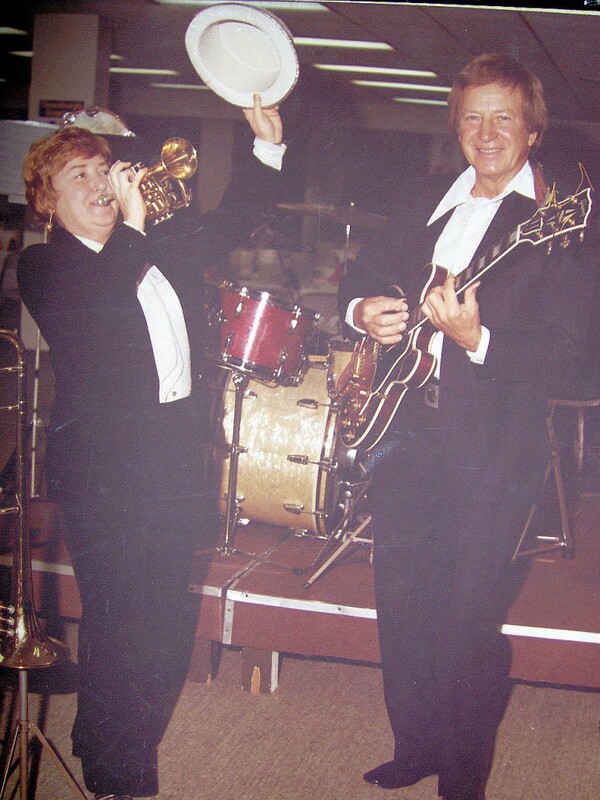 Here's the original owner playing with his swing band circa 1978. Check out that collar. Truss cover is still upside down. My wife and I spent the past week as refugees with friends who don’t live anywhere near the ocean. While there was considerable destruction inland and lots of power outages, we were fortunate to have friends who never lost power, didn’t care how long we stayed and how much of their food we ate. But it goes beyond that. I received dozens of emails and texts from readers I’ve never met and that’s a very nice thing-people who asked about my family, my house and, of course, my guitars. I am grateful and appreciative of that. The good news is that the biggest casualty was my lawnmower and all my sports equipment. I forgot that my rollerblades, my ice skates and all the snorkel gear were stored in a cabinet in the garage. You would also think that a little seawater wouldn’t hurt stuff that’s used in seawater like snorkels and fins-not true. It’s the mud… Good thing I don’t forget where the guitars are stored. I’ve never seen mud like this. It’s very fine textured and turns into cement when it dries. I’m told it’s kind of toxic as well, probably because of all the crap they dump into Long Island Sound. It’s everywhere. It covers most of the back lawn and was 5 inches deep under the house in the crawl space (I don’t have a basement). Fortunately it didn’t get into the ductwork under the house. We have friends who have been given an estimate of $50,000 to replace their ductwork after it was flooded. Apparently, it isn’t enough to clean them-you have to replace them due to mold issues. Tomorrow, I’ll get back to guitars and, with any luck, we won’t have another big storm for a few years, although I’m told there’s a Nor’easter coming on Wednesday with high winds, heavy rain and high tides. Coastal living is really nice most of the time. Especially if you’re a duck.